We're excited to welcome the cooler temps of fall weather and we’ve been embracing the shift in cooking style - recalibrating after a summer of outdoor parties, days at the beach and all the great food that goes with those. What we love about this recipe is that it takes all the flavors we love of the season and rethinks how we approach nachos! 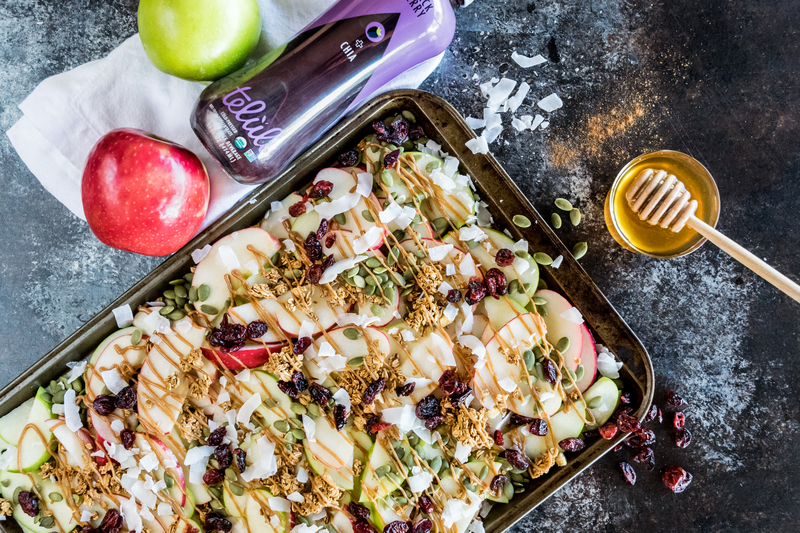 These apple nachos will be sure to be the next crowd pleasing recipe for your pumpkin carving parties ahead. Paired with Telula Cold-Pressed Juice, they are the perfect healthy fall recipe. Telula Cold-Pressed Juice makes incredible, shelf stable juices - which have become a go-to for us around here. Right now, Telula Cold-Pressed Juice is having a nationwide sale at Whole Foods - so be sure to find them in your local store's juice aisle. Click here to find them near you! On a baking sheet, arrange half of the apple slices in an even layer. In a small bowl or measuring cup, blend together the peanut butter, honey, and cinnamon, and stir until smooth. If the mixture is excessively thick, heat it gently in the microwave in short bursts and stir until light and creamy. Drizzle half the peanut butter mixture over the apple slices, then sprinkle half the granola, half of the cranberries, half the coconut flakes, and half of the pepitas. Arrange the remaining apple slices on top, then repeat with the remaining peanut butter mixture, granola, cranberries, coconut flakes, and pepitas.